The ghouls and ghost will be out in droves this Halloween season and they'll be hungry and thirsty. Halloween plates, bowls and accessories will make your holiday party a hit. 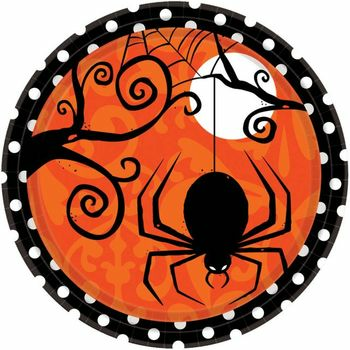 These Halloween plates and tumblers come in traditional spooky colors like black and orange to give your spooktacular event that true Halloween feel. It doesn't matter if you're entertaining children, adults or a little bit both, our selection of Halloween party supplies is unrivaled. We've got everything you need to make your party one for the record books. Our party supplies look great and many are disposable, so you don't have to worry about the mess. 9 oz. Clear Plastic Tumbler / Cup 20ct. 9" Black Paper Dinner Party Plates 16ct. 7" Black Paper Salad / Dessert Plates 16ct. 9" Black Plastic Plates 50ct. 7" Black Plastic Plates 50ct. 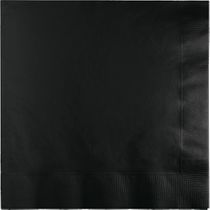 Black Plastic Rectangular Tablecloths 54"x 108"
9" Orange Dinner Paper Plates 16ct. 7" Orange Salad / Cake Paper Plates 16ct. 9" Orange Plastic Party Plates 50ct. 7" Orange Plastic Party Plates 50ct. Orange Paper 9oz. Hot/Cold Cups 8ct. Orange Paper Beverage Napkins 20ct. Orange Paper Lunch Napkins 20ct. Orange Rectangular Plastic Tablecloth 54" x 108"